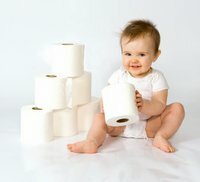 Potty training problems, how to make it easier. This page and the links in it will be invaluable for potty training problems. Potty Training Tips for BOYS and Potty Training Tips for Girls. But make sure you read this page first or come back to it, there are many basics covered here!! I have helped toilet train a lot of little kids over the years and I have tried different methods and procedures, and because I have been there, done that, I am offering you my free toddler potty training advice. First, let's discuss working with the parents, what their thoughts are on potty training problems and their kids. You will need to talk with them so you know what their view point is. Their approach to potty training problems may be completely different from how you handle it! I have had parents who have had very strong feelings about how THEY want to do it, and others who have a more easy going approach and are eager to do what ever YOU suggest! So you'll have to explain your method and listen and respect theirs- and if they are completely opposite you'll have to work out a compromise and negotiate! Potty training problems and potty training resistance can be overwhelming for everyone - that is why, for the child's sake, you have to be on the same page. You cannot possibly do one method at your house while the parent is doing something entirely different, this will cause some serious potty training problems for you. I am not saying that you have to do everything EXACTLY the same, but keep it similar so the child knows what to expect. You know, if you can all relax and approach this in a easy-going similar mode, share ideas, and do this TOGETHER the child will benefit as well as you and the parents. Reassure them that this is a growing-up step for their child and they will get there- I haven't had a child yet who hasn't! Shirley R Wrong starts potty training the kids she watches before the parents are on the same page. Results--they are confused. Course it doesn't help the poor kids have to trudge to the outhouse at Shirley's and at home they think they can use dads shed for a potty! If a parent or parents expect YOU to do the training solely at your house and are not taking their child potty at home, STOP! Time after time I will encounter that parent that expects this and is too lax on the weekends or "too busy". Believe me, this will cause you HUGE potty training problems and will not work! You will become frustrated with endless accidents- pee (and worse), poopie underwear pants! And it won't be the child's fault. The child will be so confused on what to do. On the flip side of this- If parents are trying their best at home, you will need to do your best in your daycare home. As I mentioned before, you have to work together DAILY and talk about how they are doing (at home and at daycare) to be successful in reducing potty training problems and potty training resistance. Always keep a positive attitude for a positive experience for the child- You NEVER want to shame the child (for accidents) or pressure them to go potty. Encouragement works, discouragement doesn't. I use a child-sized potty seat that securely sits on top of our toilet seat. You don't want to sit them right on the adult-size seat. That is way too scary for them, their little bottom could drop right in! These seats are easy to clean. Plus the kids love them- reducing potty training resistance. I have a child care provider friend who has each child bring their own labeled potty seat and she keeps them in a near-by closet. Great idea! I simply do not have the space in my tiny bathroom to store them. I keep a roll of paper towels in my bathroom as well as a bottle of bleach solution or disinfectant wipes to clean and sanitize after each use. I personally do not like or use potty chairs. Cute as they are, they are too hard to clean and dumping the waste is really quite gross. Why add to your toddler potty training problems? I have heard of parents moving them from room to room in their homes in hopes of setting their child on it before they go. (Or have them sit on it most of the day while they watch t.v.) Why on earth would you do that?! Children can and will learn to go on the big toilet just fine if you teach them that way- The potty is in the bathroom where it belongs! And kids learning to go won't have to transition to yet another way, from a potty chair to the toilet...plus regular toilets are available while shopping or traveling - potty chairs are not. I also have a step stool that goes up to my sink for hand washing when they are done. You'll want to be sure to supervise hand washing and teach them proper way to do it. This is an important step in toddler potty training- you don't want to promote other health related potty training problems.